A second north Belfast man has been charged with the attempted murder of leading loyalist Mark Haddock. Ronald Trevor Bowe from Mount Vernon Gardens has also been reported to the Public Prosecution Service for allegedly being a member of the UVF. The court heard that when the attempted murder charge was put to him he replied not guilty. The 29-year-old has been remanded in custody until next month. 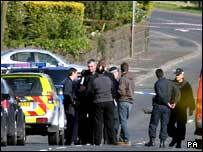 Mr Haddock, 36, survived being shot six times in Newtownabbey on 30 May. Detective Sergeant Raymond Cromie told the court that when charged, the defendant replied "not guilty". However, the officer said he believed he could connect him with the charge. Det Sgt Cromie told Wednesday's court hearing that Mr Haddock had not yet made a formal written statement of complaint. He added: "At this stage, the injured party is seriously ill. He has provided police with an initial account and is prepared to follow this through the court proceedings." The officer agreed with a defence solicitor that Mr Bowe had provided police with a written statement denying his involvement in the shooting and detailing his movements at the time. Another man appeared in court on Monday charged with attempted murder in connection with the attack.